Sometimes things just don’t progress as you would expect them to; the way they’ve always happened year after year. I’m speaking right now about the seasons here in Canada, specifically Calgary. The kids have all gone back to school and the leaves were just beginning to turn yellow. We enjoyed a lovely weekend of football and outdoor activities….and then it was over. Calgary has already been placed into the icy grip of winter…with two weekends of summer still to pass. The green leaves on the trees have captured huge amounts of snow, causing the trees to bend then snap as the load becomes too much to bear. In word this early snow and absence of a proper fall is brutal. It is soul damaging. With 8 months of every year being winter and enduring freezing temperatures and darkness. Sound depressing? If you live in Canada you know exactly what I’m talking about. A short hour later they were literally transformed into Borscht. Which got made into fritters. 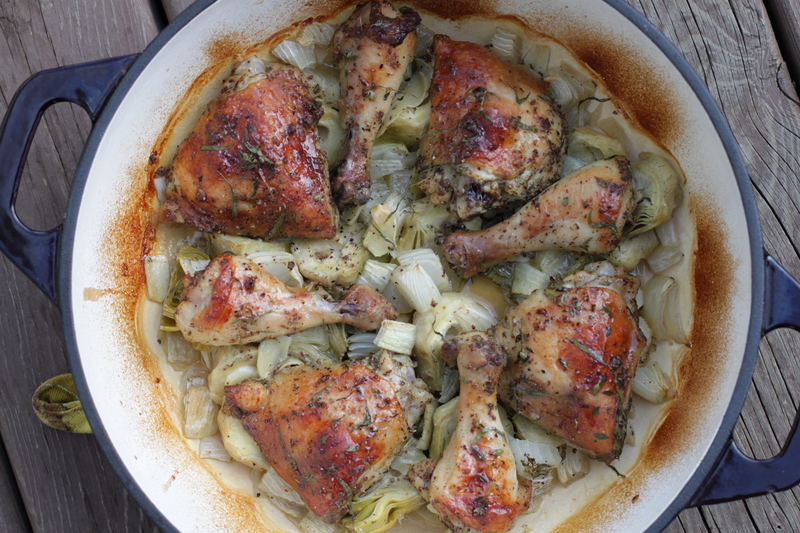 A tasty Artichoke and Chicken Dish to help use up all those homegrown herbs. 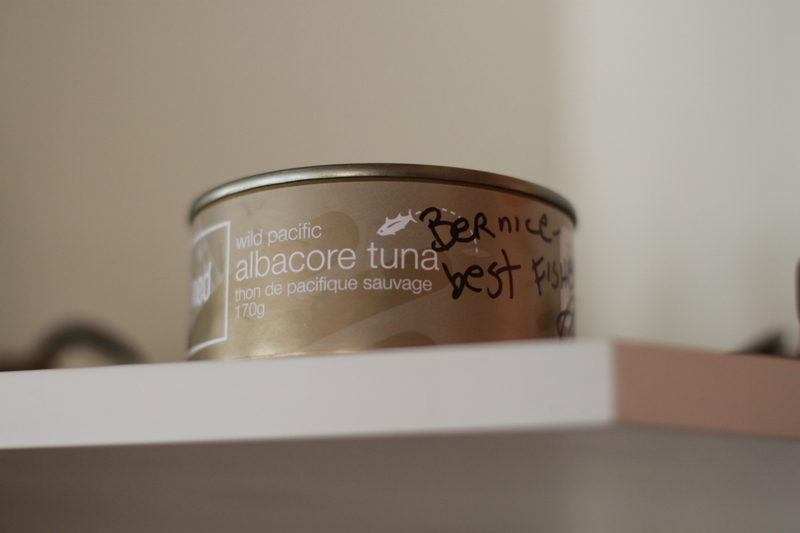 A can of NED tuna signed by Ned Bell, a Vancouver Chef doing a cross Canada bike tour to raise awareness about sustainable seafood and Bob Blumer, Chef and Food Network Celebrity. 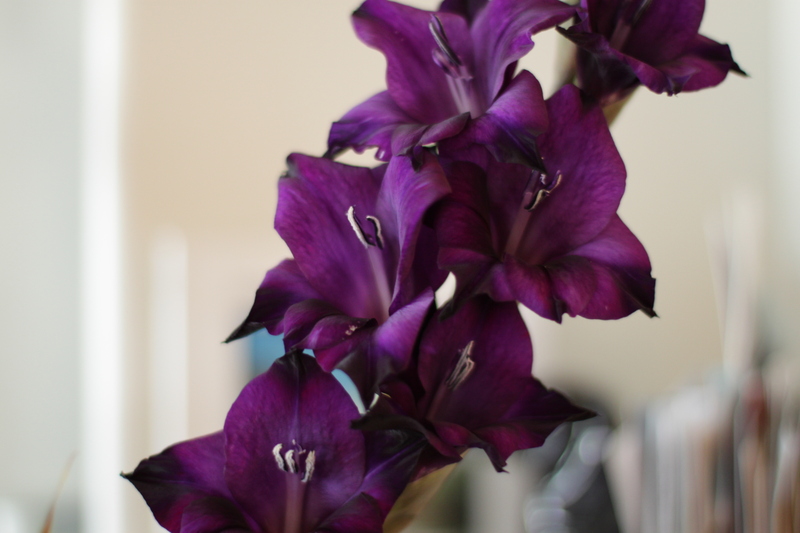 And to prove it’s not all about the food, some dark purple gladiolus to remind me of warmer days. Thank goodness for Celia at Fig Jam and Lime Cordial. I know soon the weather will be heating up in Australia just as ours is cooling down here. I’m looking forward to hers and many more posts from the land down under so that I can live vicariously through them as the snow is blowing outside here in Calgary. If you would like to join us check out her September post of In My Kitchen. Oh, I cannot believe that it has already snowed in Calgary! I remember my Winnipeg winters all to well and understand completely how you feel. I hope that you are able to plan a holiday to warmer climes during the school holidays – it’s the only way to break the icy grip of a Canadian winter! 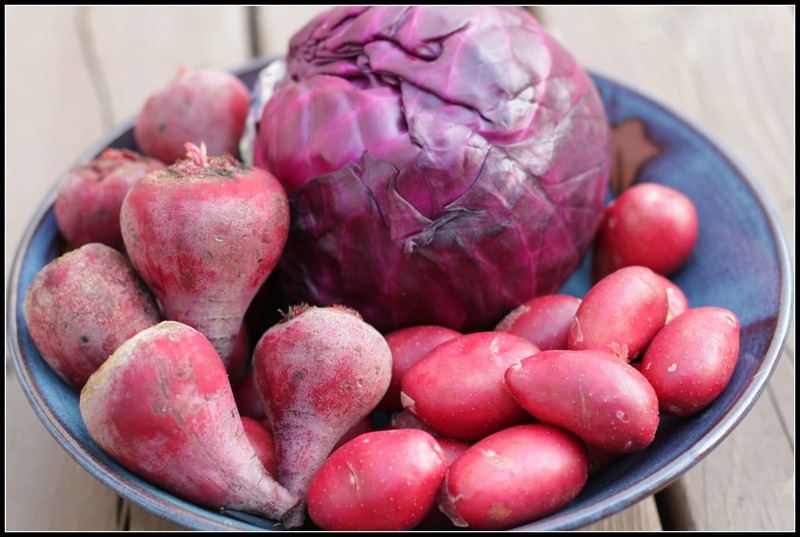 Love all the purpleness going on in your kitchen! The chicken and artichokes look absolutely delicious!! Living in a temperate climate, I can only begin to imagine how it is to live with a long cold winter. We’ve had a very early burst of warmth, the seasons are definitely changing. 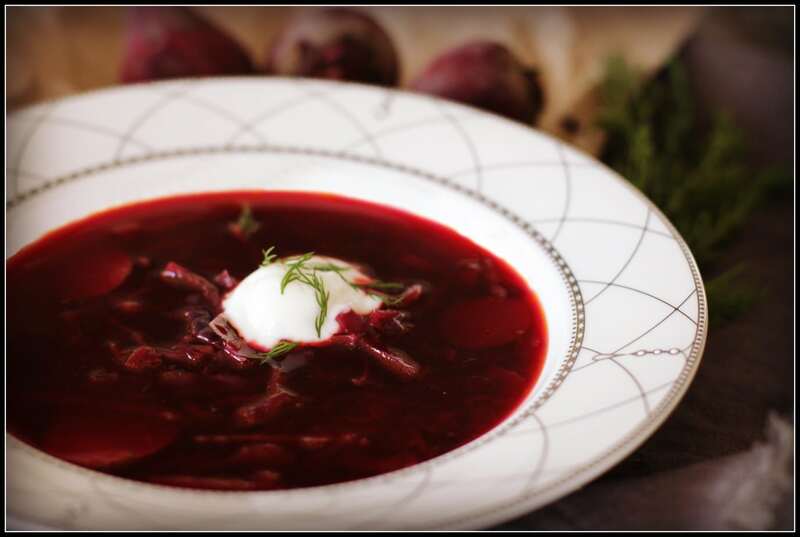 That borscht looks stunning! oh for sure it’s brutal. soul crushing even. Living in northern Australia provides a climate where it’s never really cold. Not like growing up back in Maine. That said, I’m quite happy to have summer back when you’re done with it. That borscht sent me swooning and wishing I had all the ingredients in the house to start cooking it right now. It’s a favourite of mine! Great! Make sure you post some lovely summery pictures so I can remember what it looks like! i love your purple produce and flowers. What a shame your summer has gone out with a bang not a whimper:) Living in sunny queensland (as does Maureen) it is hard to remember that other climes have so much winter ahead of them. 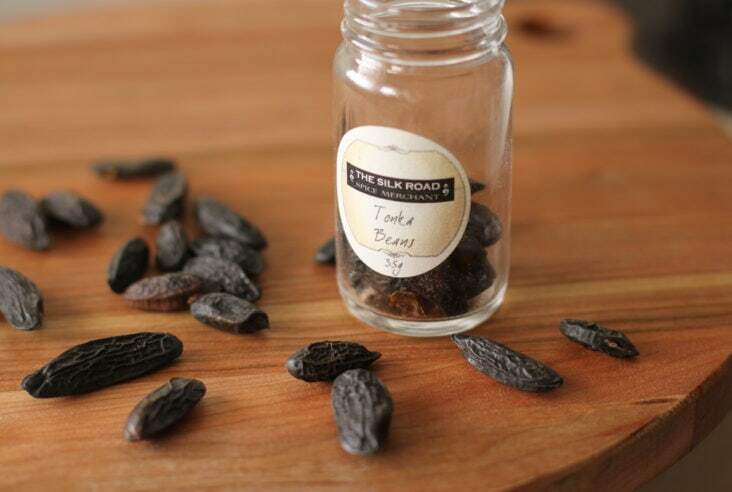 it is a gorgeous day here and we are off to a food fair this weekend. keep warm. I’m not sure why…but your message got spammed! I think you’ll be fine next week and for a while after that. What we here in Calgary are calling ‘Snowtember’ is OVER!!! YAY! Back to sunshine for a while yet but watch out for those nights, they can get pretty nippy! Have a great trip! G’day! 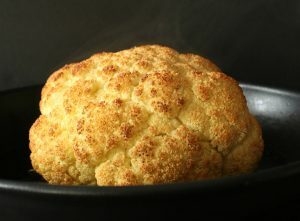 Gorgeous photographs that I was able to savour the flavour of every one! Thanks for brightening my day with your kitchen view also today! Nice to hear from you Joanne 🙂 Have a great day! Oh, poor you, snow already! Your food looks delicious though. Kohlrabi fritters? Wow, those look interesting. 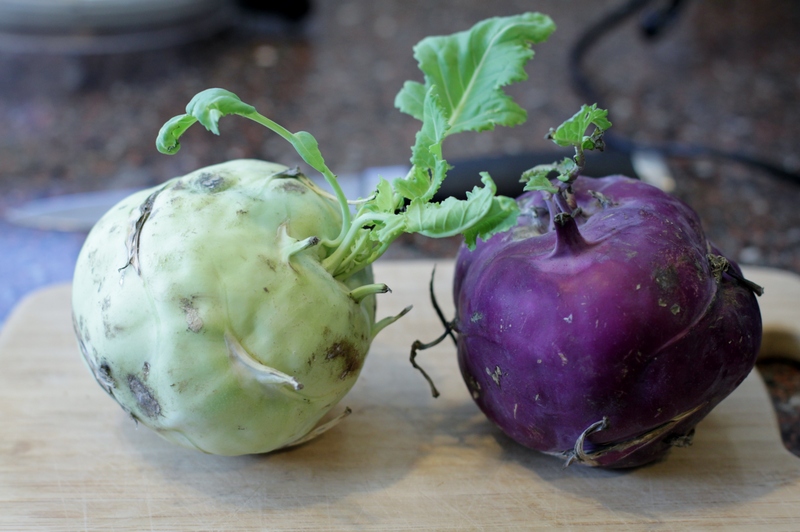 Not even sure I’ve ever seen kohlrabi here in Alice Springs. Thank you for the tour of your kitchen. Stay warm!